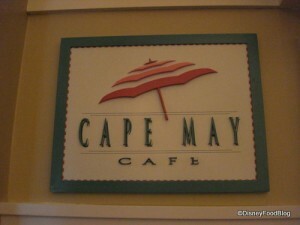 Cape May Cafe’s breakfast is one of the best places to see some of the “Fab Five” characters outside of the parks. Minnie, Donald, and Goofy can often be found at Cape May Cafe, all dressed up for the beach! This restaurant offers a morning breakfast buffet and an evening clam bake buffet; both meals are delicious and highly recommended. Both have some of the best buffet food on property. For breakfast, expect a great buffet with just about everything you need: hot items like oatmeal, egg dishes, breakfast pizza, pancakes and Mickey waffles, and more. Also included on the buffet are pastries, cereals, fruit, and bagels and lox! For dinner, your standard Clam Bake items are available: clams, mussels, shrimp, salads, chicken, carved beef, pasta and more. There’s plenty here for non-seafood eaters! The entrance for this restaurant is right off of the Beach Club lobby; just follow the smell! Oreo bon-bons are one of Disney World’s most famous dishes, and you can only find them at the Cape May Cafe Clam Bake. Characters are subject to change, but usually include Minnie, Goofy, Donald, and sometimes Chip and Dale.